Last week we watched how pro drifter Vaughn Gittin Jr. used his skills to celebrate St. Patrick’s Day by taking a 900 horsepower Ford Mustang RTR around a cloverleaf interchange in Lake Worth, Texas, drifting it the entire time. You really have to see it to believe it. In the original video, Vaughn Gittin Jr. drove the same Ford Mustang RTR that he drifted around the Nurburgring, but with a brighter, greener livery for the sake of the Irish holiday. In this video, Gittin Jr. and his crew give a behind the scenes look into how they pulled off this crazy stunt. Stuff that goes beyond just getting the cops to close the interchange. It only took Gittin Jr. a few attempts to pull it off, and much of the road looked free of tire tread prior to his Ford Mustang ripping by. Since the main video was released Ford Performance also uploaded another video showing the drift in an unedited single take. Interestingly, in order for the cameras to keep up with Gittin Jr. in his Ford Mustang RTR, a second Mustang was required as a camera car. 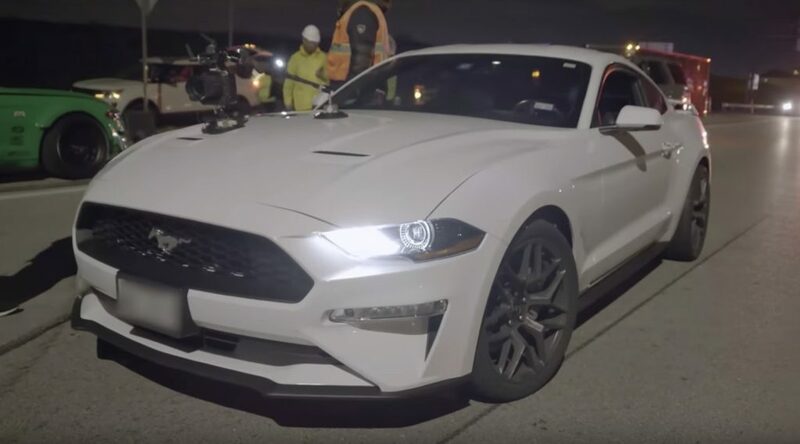 The video was shot using a white 2.3L EcoBoost Performance Pack Mustang as a camera car, and Gittin Jr. applauded its ability to keep up with his mean, green, 900 horsepower ‘Stang. “It was just the right amount of sketchiness and fun together… and quite a bit more challenging than I had expected linking it all together. And doing it at night made it that much more intense,” said Gittin Jr. after completing the stunt. We have to applaud Gittin Jr. for his efforts and skill behind the wheel of such a monstrous vehicle.